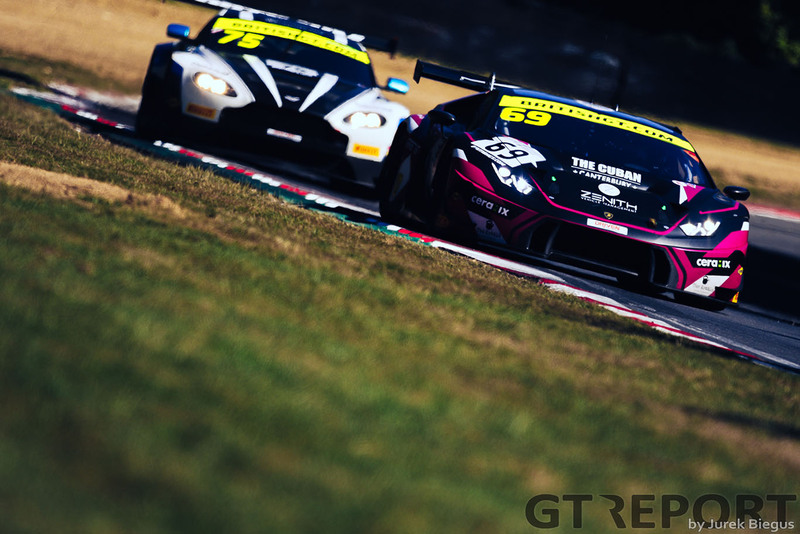 Optimum Motorsport moved to the top of the British GT Championship drivers’ standings with just one race to go as Flick Haigh and Jonny Adam converted pole position to their second win of the year at a sun-drenched Brands Hatch. At the start of the two-hour race, Haigh was untroubled as she pulled away from fellow front-row starter Andrew Howard in her Aston Martin V12 Vantage while Howard – also in an Aston Martin – found himself immediately under pressure from Jetstream Racing’s Graham Davidson. 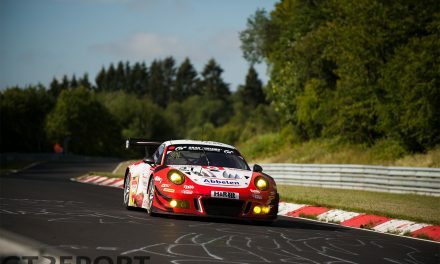 Haigh was gaining half-a-second a lap on her GT3 rivals behind – heeding team-mate Adam’s advice on the grid to get her head down and focus on setting quick laps – and by the time the first safety car was called for with 28 minutes of the race gone, she had a lead of 17.3sec. After a six-minute safety car, to recover the stranded Team HARD Ginetta G55 GT4, she quickly pulled clear – aided by Davidson pulling off a great overtake down the inside of Howard going into Paddock Hill Bend. However, the field was only under green flag conditions for two minutes before the race was neutralised again after Mike Newbould – in a HHC Motorsport Ginetta – tangled with Paul Vice in the Invictus Games Jaguar F-Type. The collision – on the main-straight – sent the Ginetta into the barriers and almost totally destroyed the car. 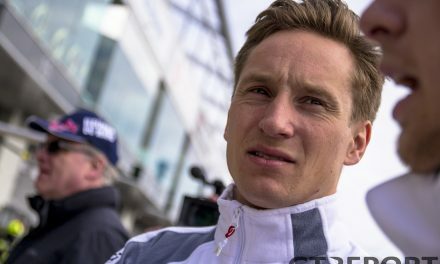 Despite Newbould showing his displeasure as he was led to the pit lane, the stewards judged him to have been ‘driving in a manner incompatible with safety’ and disqualified the car from the race. After the recovery work was done, Haigh made another great start from the head of the field to ensure she handed the car over to Adam in the lead when she pitted with 58 minutes remaining. 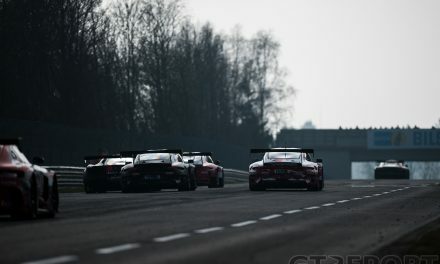 However, with the field bunched up under the safety car, the pair’s success time penalty for their Spa podium allowed the Barwell Motorsport Lamborghini of Sam De Haan and Jonny Cocker to take the lead. Even with Adam trying everything he can to past Cocker, it appeared the Lamborghini driver would hold on for his first win of the season. However, with just five minutes to go Cocker, struggling with tyre wear on the Huracan, ran a fraction too wide at Dingle Dell and allowed Adam to charge through. The Scot held onto the lead and won by 4.7sec, giving him and Flick a 17.5 point lead over the second Barwell entry of Phil Keen and Jon Minshaw heading into the season finale at Donington Park after the latter crew had to retire from the race. 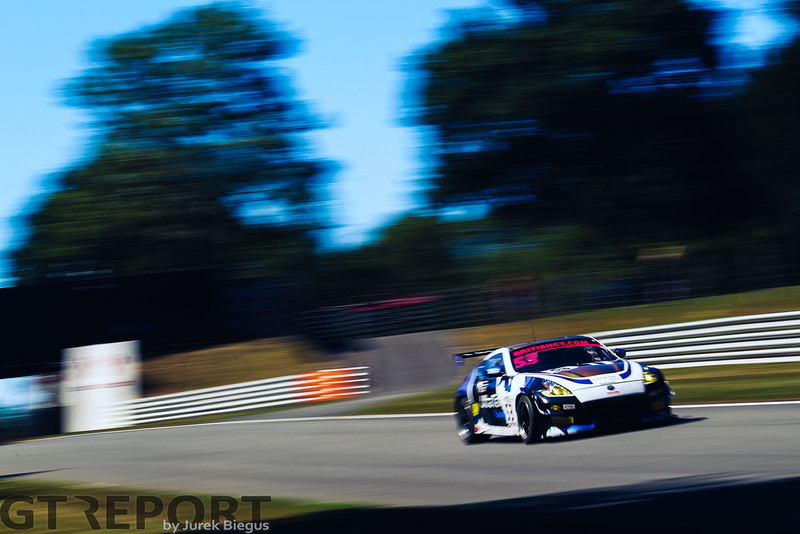 The pair had made a strong start with Minshaw at the wheel, and Keen looked set for at least a top five finish after a stint-long battle with both Darren Turner – in the Beechdean Aston – and Nicki Thiim in the #11 TF Sport Aston. However, with 22 minutes remaining, Keen pulled the Lamborghini into pit lane from fourth place with smoke coming from the engine bay. Their misfortune benefited Thiim, who, in the closing moments of the race, squeezed past Turner and secured the final spot on the podium. 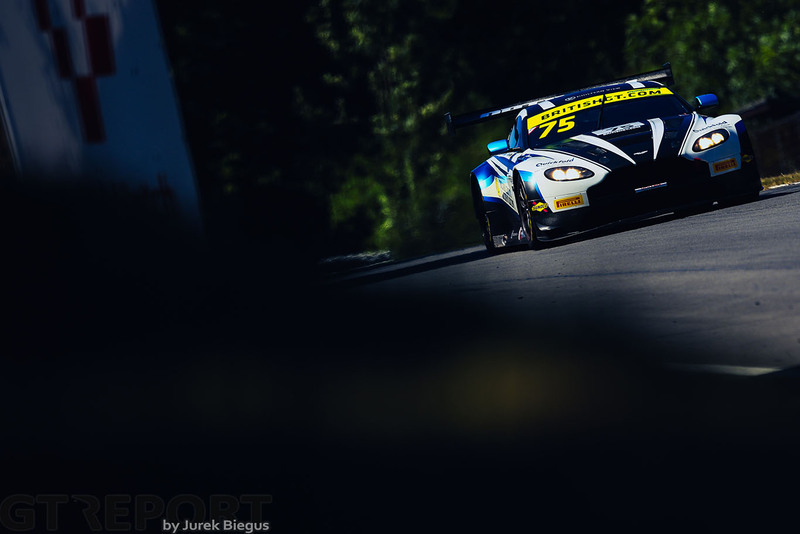 The Dane, who shared with Mark Farmer, was using TF Sport’s regular Blancpain GT Series car this weekend after their original entry set alight at Spa two weeks ago. 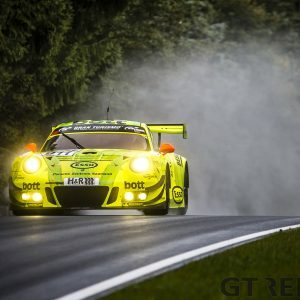 The pair are only 1 point behind Keen and Minshaw, with an outside chance of securing their first British GT title at September’s season finale. Fourth place went to Turner, with Yelmer Buurman securing fifth after a strong race for the Dutchman and co-driver Lee Mowle. Jetstream sadly failed to capitalise on Davidson’s early pace after a scary incident for Maxime Martin forced them to retire. The Belgian had to limp the car back to the pits after a foreign object penetrated the windscreen of the Aston. Martin had to go to hospital for precautionary checks on his eyes, but was thankfully given the all clear. After a close qualifying battle, the race turned out to be as equally frenetic in the race as second, third and fourth was eventually settled by a last corner sprint to the line. 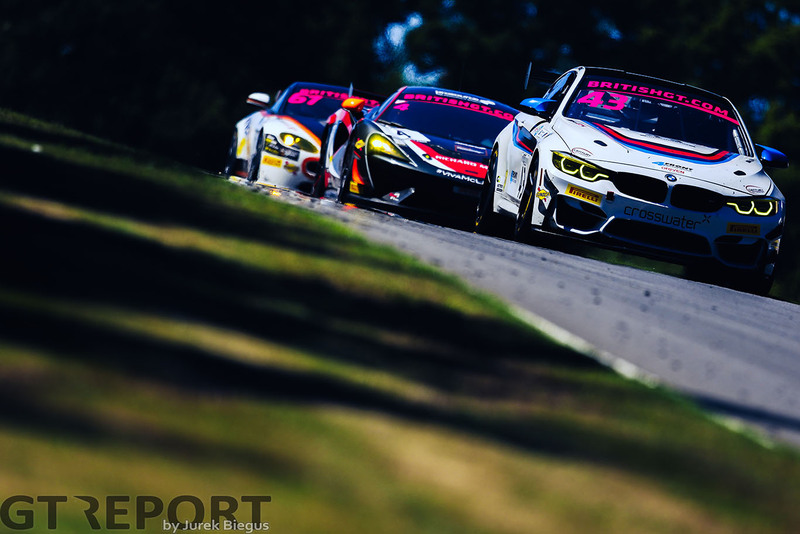 At the start, Ben Green took the lead from Century Motorsport team-mate Dean MacDonald and quickly established a gap of more than a second between the two BMW M4s. Green maintained his lead throughout the safety cars and pitted the car to hand over to Ben Tuck in the lead. However, the mandatory time penalty for Silver Cup entries favoured the Pro-Ams because of the bunched up field. 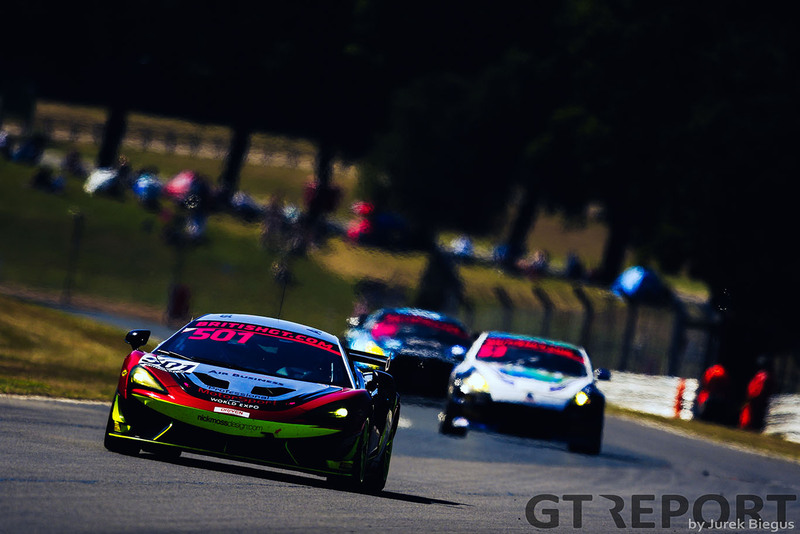 With no penalties, the Balfe Motorsport McLaren 570S of Graham Johnson and Mike Robinson rocketed up the order. Having pitted from 13th – after Johnson did a great job to battle understeer in the car – Robinson found himself in the lead, and tailed by Martin Plowman in the UltraTek Racing Team Nissan 370Z. 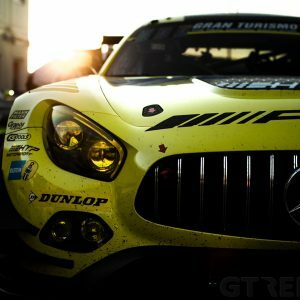 Plowman, who had taken over from Kelvin Fletcher, quickly found himself, in his words, defending like he never had before as Scott Malvern in the Team Parker Racing Mercedes-AMG GT4 latched onto the back of the Nissan. Malvern had the pace on the straights, but through the corners Plowman could just about hold on in what is a crucial championship battle between the pair. However, neither of them could manage with Tuck’s rapid pace as he recovered from slipping out of the top five after the pit stops. First, on the road down to Hawthorn, Tuck neatly robbed the Mercedes of third-place. Then, on a frantic run to the line, a great door handle to door handle fight with Plowman gave Tuck second – by just 0.116sec. Their battle had given Malvern a sniff of a podium, and by eye it looked like he had taken third, but the timing screens showed him in fourth – only 0.059sec behind. Fifth place went to Joe Osborne, the McLaren factory driver rewarding the Tolman Motorsport team for an all-nighter replacing the car’s engine by building on David Pattison’s opening stint starting at the back of the grid. 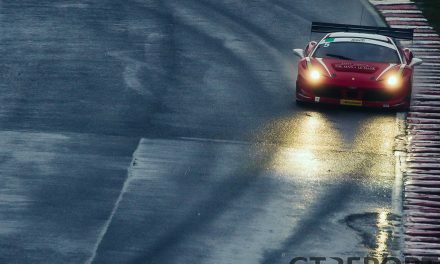 The final round of the British GT Championship takes place at Donington Park on September 22&23.